Definition at line 33 of file CLReactionGlyph.h. Definition at line 37 of file CLReactionGlyph.cpp. Definition at line 43 of file CLReactionGlyph.cpp. Definition at line 49 of file CLReactionGlyph.cpp. Definition at line 58 of file CLReactionGlyph.h. Referenced by CQLayoutScene::addGlyph(), CCopasiSpringLayout::addReactionVariables(), CLayout::calculateBoundingBox(), CQConnectionGraphicsItem::CQConnectionGraphicsItem(), CLLayoutRenderer::draw_layout(), CCopasiSpringLayout::finalizeState(), CLLayoutRenderer::getObjectsAt(), CLLayoutRenderer::getObjectsInBoundingBox(), CQGLLayoutPainter::mouseMoveEvent(), CLLayoutRenderer::move_reaction_glyph(), CLLayoutRenderer::move_selection(), CLLayoutRenderer::move_species_reference_glyph(), compareGraphicalObjectsBySize::operator()(), CCopasiXML::saveLayoutList(), CCopasiXMLParser::MetaboliteReferenceGlyphElement::start(), CCopasiXMLParser::ReactionGlyphElement::start(), CLLayoutRenderer::update_associations(), CQGLLayoutPainter::update_status_and_cursor(), and CLLayoutRenderer::update_textures_and_colors(). Definition at line 59 of file CLReactionGlyph.h. Reimplemented in CLReactionGlyph, and CLGeneralGlyph. Definition at line 88 of file CLReactionGlyph.cpp. References mCurve, CLGraphicalObject::moveBy(), and CLCurve::moveBy(). Referenced by CLGeneralGlyph::moveBy(), and CLReactionGlyph::moveBy(). Definition at line 76 of file CLReactionGlyph.cpp. Referenced by CLReferenceGlyph::operator=(), CLMetabReferenceGlyph::operator=(), CLGeneralGlyph::operator=(), and CLReactionGlyph::operator=(). 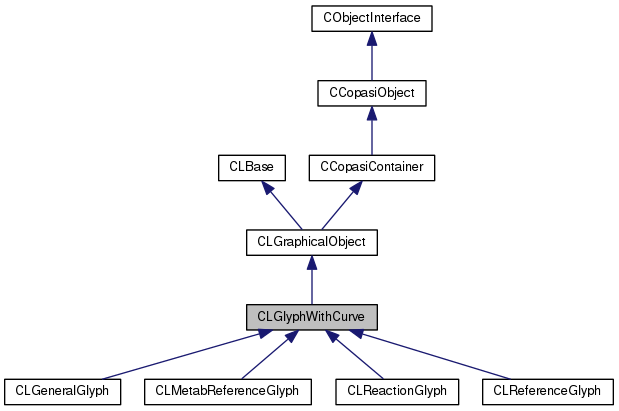 Reimplemented in CLReactionGlyph, CLGeneralGlyph, CLMetabReferenceGlyph, and CLReferenceGlyph. Definition at line 102 of file CLReactionGlyph.cpp. Definition at line 60 of file CLReactionGlyph.h. Definition at line 94 of file CLReactionGlyph.cpp. Definition at line 36 of file CLReactionGlyph.h. Referenced by CLGlyphWithCurve(), CLMetabReferenceGlyph::CLMetabReferenceGlyph(), CLReactionGlyph::CLReactionGlyph(), CLMetabReferenceGlyph::exportToSBML(), CLGeneralGlyph::exportToSBML(), CLReactionGlyph::exportToSBML(), getCurve(), moveBy(), operator<<(), operator=(), and setCurve().